anyone can use the power key! On or off the court, everyone can use the benefits that the Power Key has to offer. From the novice to the pro, the benefits are clear. We recommend an age group of 5 years of age and up. So children can use the Power Key as well as adults. This is the perfect item for men, women, and children. The Power Key complements your desire to play actively and get more power and accuracy in your game. Order some for your friends as well, they will surely thank you. The Power Key may be used before, after, and during match. So anyone, at anytime, can take the Power Key from your pocket or carry-cord, and quickly make their playing consistent during the match. Are you thinking of using it for your racketball strings? 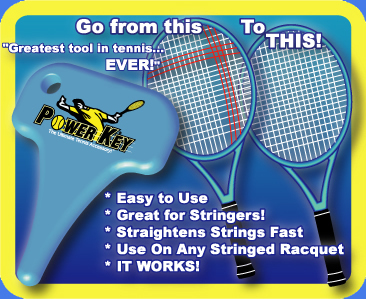 Sure, the Power Key is built tough and can be used on any stringed racket while following the provided guidlines of use. Click on a button to the right to see a demonstration of the Power Key in action!